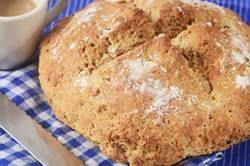 Irish Soda Bread: Preheat your oven to 400 degrees F (200 degrees C) and place the rack in the center of the oven. Line a baking sheet with parchment paper. In a large bowl, whisk together the flours, sugar, oats (if using), baking soda, and salt. Make a well in the center of the flour mixture and add most of the buttermilk. Using yours hands, or a wooden spoon, mix (adding more buttermilk if necessary) until you have a soft, and slightly sticky, dough. Transfer to a lightly floured surface and gently knead the dough into a 7 inch (18 cm) round. Place the round on your prepared baking sheet and then, with a sharp knife or clean kitchen scissors, cut a 1/4 inch (.6 cm) deep "X" across the top of the bread. Brush the surface of the bread with milk or cream (this helps with browning). Bake for about 30 minutes or until nicely browned and a toothpick inserted into the center of the bread comes out clean. You can also test that is fully baked by tapping the bottom of the bread - it should sound hollow. Remove from oven. This bread is wonderful when served warm with butter and jam. It also makes great toast. Makes one seven inch (18 cm) round soda bread.